Simple, flavorful and elegant! This is a showstopper! 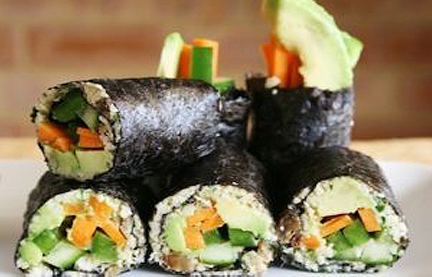 Lay a sheet of nori on a flat surface, long side away from you. Lay red pepper strips in a row along the front of the nori, letting some stick out the ends slightly. Top with shredded carrots or zucchini, avocado, sprouts, and lettuce. Moisten the far end of the nori with lemon. Roll the nori up tightly around the filling and rub the moistened end along the roll to seal. 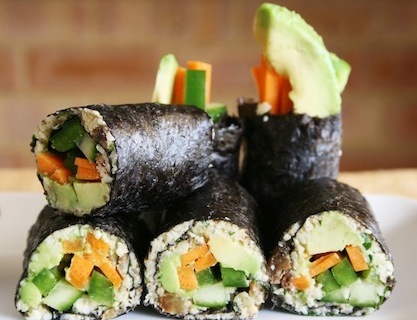 Cut the nori into several pieces, and repeat with remaining ingredients.